Stocks ended last week mostly flat, falling slightly on Friday after the major U.S. indexes set new record highs on Thursday on positive earnings surprises. The NASDAQ also notched a seventh week of gains, its longest winning streak since 2012. 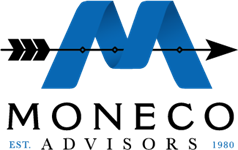 For the week, the S&P 500 gained 0.05%, the Dow grew 0.18%, the NASDAQ added 0.23%, and the MSCI EAFE grew 2.73%. Earnings season is mostly behind us, and, with nearly all of the S&P 500 companies having reported in, we have a good overall picture of last quarter's performance. Total earnings for the index so far were down 3.7% on -0.7% lower revenues relative to Q2 2015. However, 71.1% have managed to beat profit expectations, which has given stocks a boost in recent weeks. 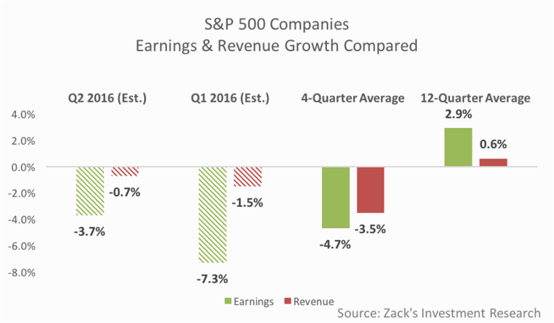 Though earnings growth is still negative, it's a vast improvement over what we saw in the first quarter from the same group of companies. Results are also better than the 4-quarter moving average. Revenue growth is also negative, showing that many companies are still (seven-plus years into the economic recovery) struggling with slow demand. The energy sector is still a drag on overall earnings. Excluding Energy, earnings for remaining S&P 500 companies would be slightly up 0.1% on 2.4% higher revenues. Though that's a rosier picture, it's still not a stellar performance. Third-quarter earnings growth estimates are steadily coming down, indicating that business leaders are not expecting standout performance. Are companies sandbagging expectations to improve the odds of a positive surprise? That's highly possible. However, we're not expecting to see meaningful growth pick up this quarter. Next week, we'll get a look at notes from the last Federal Reserve Open Market Committee meeting. Analysts use these meeting minutes to get a sense of what the Fed is thinking about the economy and see how different members of the committee are voting. The rest of the week is also full of important economic releases, which could stoke volatility if we see negative surprises. When markets experienced a sustained rally over a period of weeks, it's not surprising when investors pause for a breather to reevaluate the data. Consumer sentiment increases in August. A measure of American optimism about the economy increased this month, hopefully supporting future consumer spending. Retail sales remain flat in July. Sales of retail goods remained surprisingly unchanged last month as Americans cut back on purchases, moderating expectations of a surge in consumer spending this quarter. Business inventories rise slightly in June. Business stockpiles edged higher in June as sales surged, suggesting U.S. firms are having an easier time moving products off shelves. Job openings edge higher in June. The number of available jobs rose slightly over May, suggesting moderate growth. An increased number of factory job postings could indicate movement in the manufacturing sector.